What is it that makes so many of us so devoted to KVN's music and makes us want to associate ourselves with him? I will try to answer the question as objectively as I can. One way of answering it would be to use the definition of the term 'competence' which I often use in analysing any kind of competence - even though it might seem odd to use this word in the case of KVN. The definition is that competence consists of three aspects: knowledge, skills and attitude. I will take attitude first. KVN had the greatest respect for his musical heritage; the other side of the coin was his deep humility. Yet he was highly self-confident, sure of himself. He never asked anyone what he or she thought of his music. His aim was to offer blemishless music and he strove hard to fulfil this aim. Fact of the matter is that he did fulfil it. There were many occasions when he faced severe handicaps - like poor hall acoustics, or faltering accompanists, or arriving for the concert after an arduous journey - but he never compromised the integrity of his music. What about his musical knowledge and insights? Throughout his life and career, KVN strove to distinguish between what is good and what is not good in music. He had a finely honed sense of discrimination and he applied it diligently, intelligently. Interestingly, he believed it was important first to know what not to do, what mistakes to avoid. KVN gained knowledge and insight more by keen observation than by study of treatises. He knew technique alone did not good music make. He knew the importance of aesthetics in art music; and he knew how to employ technique to invest his music with beauty, with the highest aesthetics. And he knew that a sense of proportion and restraint were essential for achieving the aesthetic goal. Many of the great masters of Carnatic music seemed to have known, intuitively rather than by any other means, that what makes Indian art music unique is the concept of raga informing it; that any artist worth that grand appellation should endeavour to explore the raga image embedded in compositions through the application of his creative imagination; and that this exploration should be guided by aesthetics and by the goal of producing aesthetic relish among the listeners. KVN's music is testimony to the fact his knowledge and insights encompassed these truths. absolute clarity in uchcharippu or enunciation of lyrical text. He could handle intricate pallavi-s dexterously and with seeming ease in that highwater mark of a Carnatic music concert, namely, the ragam-tanam-pallavi. He could employ permutations and combinations derived from arithmetical calculations in his presentation of kalpanaswara-s, even though he never overloaded this exercise in musical imagination with what is commonly referred to as 'kanakku'. He could - and did where warranted - employ to great effect the technical device called kuraippu in Tamil - the progressive shortening of the avarta of a tala cycle. We might also include among his skills his proficiency in singing compositions in five different languages: Sanskrit, Tamil, Telugu, Kannada and Malayalam - with proper pronunciation and intonation. Whenever he sang and wherever he sang, what he sang reflected a distinctive combination of all three aspects: deep knowledge and insights, mastery of skills and the right attitude. His raga alapana essays were relatively short. I don't believe that the length or duration of an alapana is a yardstick for judging its acceptability or quality. What matters is how well the artist brings out the image or personality of the selected raga - without repeating himself where the alapana is long. The tastes and the capacity for raga elaboration vary from one artist to another. Thus, it is said, while Veena Dhanammal's concise music was like bottled perfume, Tiger Varadachariar's music of imagination was like taking a leisurely stroll in a fragrant garden. Both Semmangudi Srinivasa Iyer and G.N. Balasubramaniam considered Ariyakudi Ramanuja Iyengar as their role model, but both of them offered expansive raga alapana-s, unlike Ariyakudi. KVN, on his part, did not exactly pattern himself on Ariyakudi who was his guru and role model, but he probably never sang an alapana for more than 10 minutes. Nonetheless he invariably succeeded in imaging the raga fully, in bringing out its quintessence. Like his master, he left the listeners pining for more, rather than satiate them. KVN could boast of a very large repertoire of raga-s and songs, though, humble as he was, he never made any claims himself. What is important to note is that his repertoire was large enough to allow him to offer variety in his concerts. By the way, the real aim of Ariyakudi in setting up the concert format the way he did was to offer variety to listeners. KVN's way of handling kriti-s was another plus point. Essentially, he followed the path shown by Ariyakudi, but his approach had been moulded as well by three others from whom he had received lessons: Palakkad Mani Iyer, C.S. Krishna Iyer and Papa K.S. Venkataramiah, and by two members of the Dhanammal family, namely T. Jayammal and T. Balasaraswati. The influence of Ariyakudi was particularly noticeable in the kalapramana or pace of singing he favoured. Like his master, he was partial to kriti-s set in madhyama kala or middle speed. And, like his master, he was very adept in singing certain kriti-s learned from him, like Hechcharikaga ra ra, in a speed called 'rendungettan' in Tamil, a speed in between madhyama (middle) kala and chauka (slow) kala; and, remarkably, at maintaining the tempo when he doubled the speed. In short, he had total mastery over laya. Where it was warranted, he dropped the speed or raised it significantly and yet his laya control remained intact. KVN absorbed, internalised and utilised in his own way the elements of style that were characteristic of the music of Jayammal and Balasaraswati. The best example of this was to be found in his singing of Krishna Nee Beganey, in which he caressed the words and phrases exquisitely and had the audience in a trance, as if he were pied piper. I must also mention the depth of emotion and the pathos he invested in singing certain compositions of Gopalakrishna Bharati, especially Varugalamo ayya. 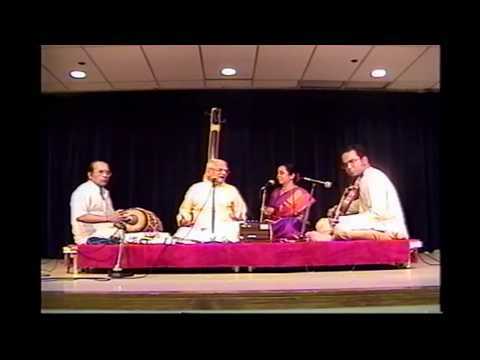 I find delicious irony in the fact that the two musicians who sang the Tamil songs from Gopalakrishna Bharati's Nandanar Charitram beautifully and movingly, namely K.V. Narayanaswamy and Puducode Krishnamurthy, both belonged to Palakkad! KVN showed that musical imagination had a role even in the exposition of kriti-s or other pre-composed items. KVN's manodharma was evident in his kalpana swara-s also. But this aspect of his music also reflected his predilection for proportion and restraint. He did not offer swara-s by the yard; almost always, they were compactly packaged. And they were like a gentle cascade rather than a torrent. His presentation of ragam-tanam-pallavi was informed by the understanding that the RTP is a medium more for displaying manodharma or musical creativity, than exhibiting virtuosic skills in handling laya intricacies; that in RTP, as in other genres of music, art should take precedence over, if not conceal, artifice. KVN's concerts, especially in later years, projected a sense of calm. Amidst the din and bustle we have come to expect in the concerts of most other musicians today, he was like an oasis. I will sum up Narayanaswamy's music this way. It was sampradaya sangeetam but modern. It was robust and yet reposeful. It was knowledgeable but not heavy. It was technically skillful, even virtuosic on occasion, but always aesthetic. It was replete with bhava or emotion, but never cloying. It was art music at its best, pleasing even to those who demanded the highest reward in terms of aesthetic relish.